Sample programs for use with the NXT or EV3 robots. You can download these to your computer (we know it works on PCs) and click and it should open in your MindStorms software. We've got a LEGO piano that has an 8 key setup. 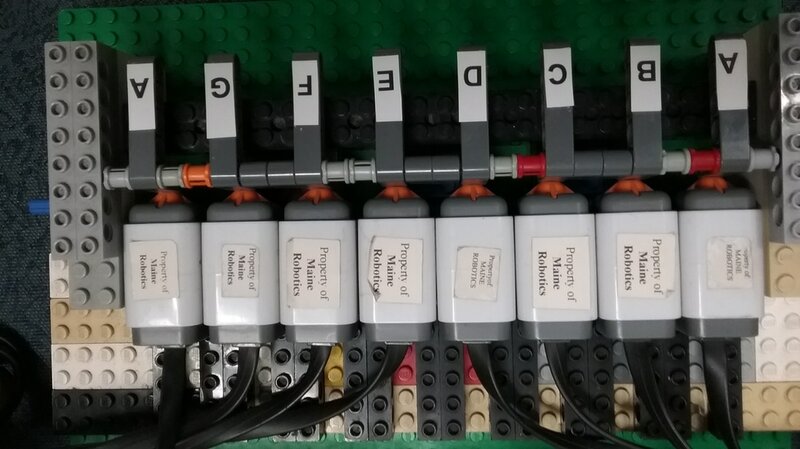 4 keys (A, B, C, D) are set to push on Touch Sensors (ports 1 to 4), which run off of one EV3. Then a second set of keys (E, F, G, A) are set to push on Touch Sensors (ports 1 to 4) on a second EV3 controller. Find below the PROJECT, and in the project are the two PROGRAMS, one each for the two EV3s. The construction is basically a frame that holds a set of long axles that run from the end supports, through the key pivots and spacers, and the mid supports. Each key is a 3 x 5 right angle Technic lift arm that is resting against the touch sensor's switch. When you push down on the key, it causes the sensor to be pushed, which results in the NXT or EV3 getting the signal and playing the note. NOTE: make sure your wires match up to the ports/notes you want. It's easy to swap wires if they get turned around. The NXT programs are available here as well. The build is the same, but the programs differ. 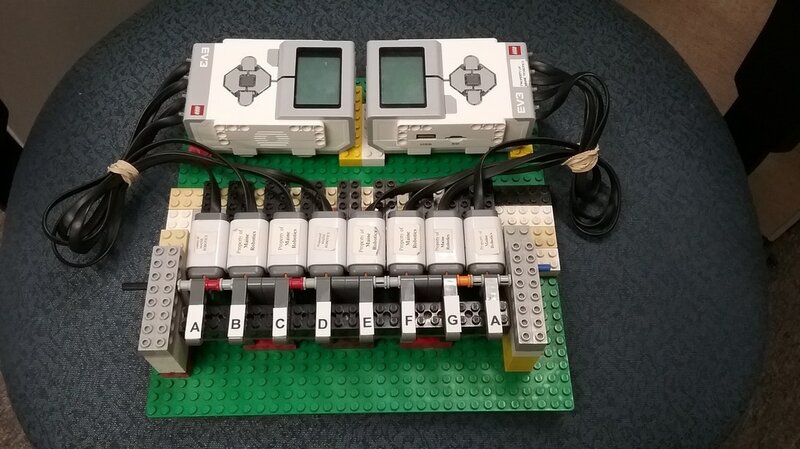 In Theory, you could really push the limits if you could have 4 motors being used as rotational sensors for 4 more keys... and if you built it such that additional keys pushed on the EV3 control buttons, you could add 5 more keys that way. 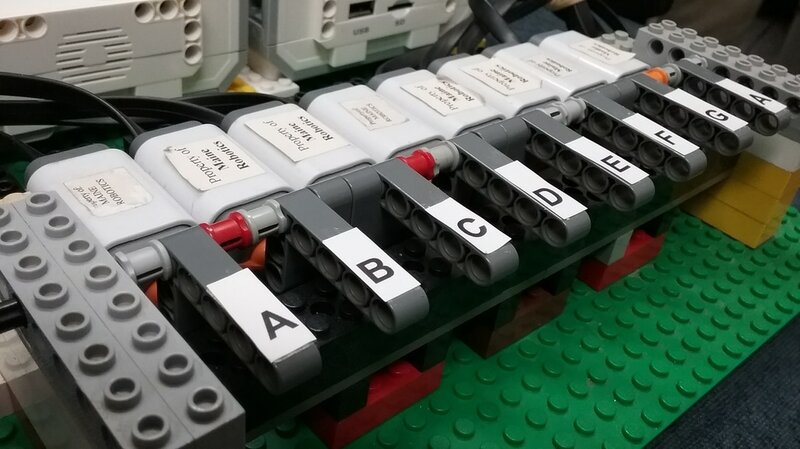 And the cool thing is if you used the control buttons on the EV3, you could start/select things by using the keyboard keys... A B might be the left, a C the center, a D the left buttons, etc. NOTE, this does NOT play chords. You could do that if you had the sound files that would be used, but the NXT and EV3 do not combine notes to produce chords.